"In my youth I played the piano. In my 70s I am playing with the piano." Last year, having recently completed a number of large-scale installations, Lisa Gross was gifted the insides of an old piano. This riche cache of mechanical parts begged to be transformed into a series of small sculptures. Gross, a sculptor was thus challenged to work on a scale quite the opposite of what she had been working on of late. In addition, the materials themselves - small, brittle wooden parts, felt hammers, and springs - posed their own set of challenges, forcing Gross to limit the scale of her figures and invent new methods of joinery. What very soon began to emerge were performers. Alexander Calder’s circus, created in the 1930's-50’s, has long captured Gross' attention and imagination. Calder's irreverent use of crude wires and cloth scraps to create performers, and the playfulness with which he himself activated his motley cast of characters, amuses her greatly. With Calder as her inspiration, and the piano parts as her raw materials, she began to envision, one by one, her own troupe of entertainers. The myriad of acrobats, juggling clowns, flying trapeze artists and others that animate Lisa Gross' newest installation, Piano Forte, are the result of this playful journey into rhythm, motion and color. Piano Forte is a site-specific installation, created for the window of the Tova Osman Gallery. Lisa Gross’ work “Exodus” celebrates the series of deliverances that have, throughout history, affected the freedom and reunification of the Jewish People. Utilizing the indigenous spathe of the palm tree, whose womb-like form and botanical function suggests Divine protection, the piece visually conjures the Parting of the Red Sea, the “original” Exodus from Egypt. “Exodus” dynamically picks up this dramatic event of the Divine intervention which was taken to be a historical fact from that time onward, and has molded Israel’s attitude to its god. This miraculous event, itself a watershed in both Jewish history and the history of Divine intervention, provides an archetype for the modern-day rescue of Jewish communities from around the world. 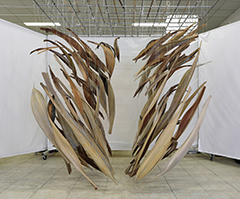 The proposed installation by Lisa Gross, focuses on the very moment of the vigorous wonder. Dozens of palm tree spathes, suspended on transparent thin cords, evoke the cascading, divided waters. 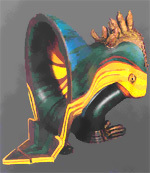 Their direction of flow fluctuates between earthbound and heavenward, an intertwining of the human and divine spheres. Circumnavigating the piece, the viewer becomes aware of the changing forms, textures and hues of the hanging pods and experiences their enchantingly beautiful movements. The work changes constantly, activating a chain of associations, transformed into nearly immaterial forms, essences of movement, like notations for silent music. For the previous solo exhibition by Lisa Gross (2015), Dr. Smadar Sheffi wrote about Gross’s usage of organic materials. “Lisa Gross formulates a poetic statement on reality and movement in which numerous associations are omnipresent. The palm, a term for more than 200 genera of species, is laden with symbolism. In ancient Greece and Rome, palms symbolized victory. In Judaism, the palm has a ritual role: a palm branch with un-separated leaves is the lulav, one of the Four Species upon which Jews recite a blessing daily throughout the Succot holiday (Tabernacles). Lisa Gross’s installation generates associations to the palm with all its meanings, and to the history of suspended kinetic sculpture. The artwork itself is an autonomous entity open to the wind, the gaze and the murmur”. 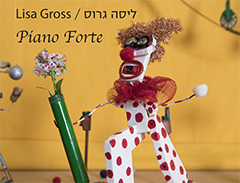 Attached is a short Video documentation of Lisa Gross’ previous installation “Turmoil” that was exhibited at Artists’ House, Tel-Aviv, (2015), and was curated by Dr. Smadar Sheffi. Turmoil, an installation by Lisa Gross, is a place that moves, breaks down, comes together, stops one’s gaze. Dozens of spathes - palm tree pods - seem to hover in the air, suspended on transparent lines hanging from a metal grid near the ceiling. The work changes constantly, activating a chain of associations from dance of the veils to a flock of birds or a school of fish. The organic components seem to be airborne ink brushstrokes, evoking Japanese or Islamic calligraphy, making motion palpable. 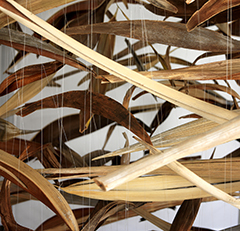 My recent series of works were inspired by the dry leaves and pods of our local date palms. With minimum intervention, I have transformed these natural elements into evocative pairs of bronze birds and sinuous bowls. To view these works, and read about the process of their creation, follow this link to “Cast of Characters”. June 2010 marked the unveiling of a new exterior wall sculpture entitled: Similar, Different...yet Connected. This piece was created in cooperation with four 15-year olds from the Rabin Junior High School in Azur as part of a project designed to interest them in working with a local artist. The students and I met twice in my studio: first to discuss the theme and concept, and then to lay out a first draft of the figures. While the students' initial inspiration came from the energetic figures of artist Keith Haring, the piece quickly took on a character all its own as I continued to experiment with the composition and fine-tune the figures during the welding process. The sculpture that resulted is at once playful and serious: its lively figures convey a message of tolerance and connectedness in spite of the differences between them. Similar, Different...yet Connected now hangs permanently at the entryway to the Rabin Junior High School in Azur. This site-specific installation, curated by Galit Mana, features two of my largest works to date: a vigorous seascape and a towering lighthouse-creature. Situated in the airy atrium of the museum, the lighthouse/creature rises some 2.2 meters high. Its metal-plated body is topped by a pulsing light that beckons the visitor to descend the staircase and signs the way to the seascape in the adjacent room. Upon entering this second, enclosed, space the visitor encounters a body of "water" composed of richly-painted multiple layers. Within this undulating surface appear numerous sea creatures assembled from a broad range of discarded objects -- metal pop-tops, silvery scouring pads, woven baskets -- all floating amongst a scattering of glistening glass nuggets. A single diver is the only human inhabitant of this sea. This exhibition focused on my use of found objects, and the creative process through which these pieces, once relegated to the trash heap, are given new lives. Minimalist assemblages such as a pair of tranquil grazing sheep demonstrate the beauty to be found in the muted colors, simple geometric shapes and barely altered forms of discards. Other, more visually complex pieces, such as Face Off, draw attention to their lyrical shapes, textures, and endless variety. An exhibition highlighting the most minimalist of my animal and human sculptures, many of which are assembled from wooden objects. Skeletal in form, these assemblages are presented as the "bare bones" of art made from found objects - bones which, as in Ezekiel's famous messianic vision, come together to form living beings. Adam and Eve, larger than life, occupied the focal point of this show, continuing the underlying biblical thread, and unifying human and animal forms through their common media. This exhibition featured numerous and diverse examples of my work, united by their creation from objects once "lost" and now "found". It situates these assemblages, and my creative process, against the 20th-century trend, led first by Picasso and then by Duchamp, of using found objects as a treasure trove for artistic works. Quotations from personal writings about my family were presented in found window frames, adding a verbal element to the visual expressions. My first solo exhibition to feature both sculptures and wall assemblages. While most of the pieces were freestanding, there were also readymade diminutive sculptures shown in a rectangular display case. A selection of small assembled sculptures, which were distributed throughout the gallery. In 2015 in a group exhibit entitled Homage to the Red Sea in the Janco Dada Museum. 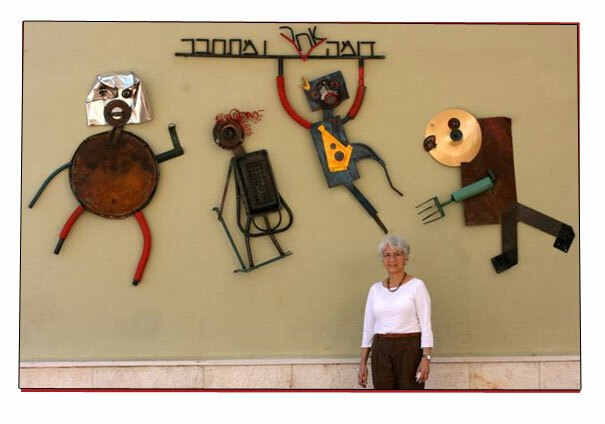 Ein Hod, Israel, Lisa exhibited a large three dimensional hanging. It was inspired by Marcel Janco’s painting The Red Sea. On the gallery wall hung a video screen showing a cycle of 11 images. These images, taken during the early stages of the works' production, give visitors insight into the creative process that lay behind Surface/Appearances. Dream Chasers is a monumental frieze of 51 warriors and animals setting out to slay a dragon. The dragon and its pursuers, all of whom were assembled from old and worn found objects, provide a timeless metaphor for such themes as the dream of victory, the conquering of one's fears and the cyclical nature of history. Exhibition at the Tel Aviv Opera House. Standard white porcelain toilets were distributed to select artists, who transformed them into visual messages pertaining to Israel's water shortage. My sculpture, entitled "Dinosaur," symbolized the country's antiquated water system - a very real detriment to our water conservation efforts. An exhibition mounted throughout the streets of Tel Aviv. 116 fiberglass dolphins mounted on metal stands were distributed to select artists, both as a means of facilitating artistic expression in the public sphere, and adding color and joy to the city. My dolphin, "Splash" is painted with soaring waves in the style of the Japanese artist Hokusai (1760-1849), famous for his paintings and prints of waves. A girl diver camouflages its metal stand. At the end of the show, the dolphins were displayed in Rabin Square and then sold at auction. A joint show featuring the works of contemporary Israeli artists. My contribution included two free-standing animal sculptures, Cow and Frog, both constructed from wooden folding chairs. An exhibition distributed throughout the streets of Tel Aviv, Herzelia, Ra'anana, Kfar Saba and Rosh Ha-Ayin, and sponsored by CreoScitex, a world leader in graphic arts and color technology. 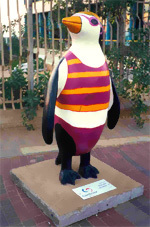 Two hundred fiberglass penguins were distributed to select artists, who were requested to "add color" to these traditionally black and white birds. My whimsical bird stands ready for a day at the beach, with his painted-on swim gear and sun-glasses. He was placed in Herzelia near the Acadia Hotel, and later auctioned off to the Royal Gardens Hotel in Eilat, where he now stands in the center of a prominent flower bed. 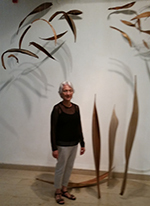 An exhibition of several free-standing sculptures and wall assemblages, which were distributed throughout the bank. Reise an kein Ende der Velt, Journey to No End of the Earth. A magnificent travelling exhibition of Judaica, centering around 33 distinct Jewish communities. The visitor was invited to "travel" from community to community, thereby discovering both the local variations and overall unity of Jewish religion and practice throughout the world. My iconic sculpture represented the modern day Jewish traveler: the traveler on the internet, and was therefore constructed from computer parts. It journeyed with the exhibition from the Vienna Jewish Museum to the Frankfurt Jewish Museum to the New York Jewish History Museum, and back to Israel to Tel Aviv's Diaspora Museum. This exhibition focused on the image of the Hamsa, an amuletic charm intended to ward off the evil eye. Numerous artists presented their interpretations of this venerable symbol, whose popularity has sky-rocketed in recent years. 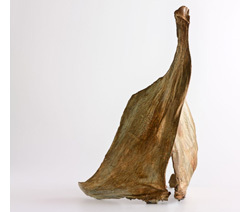 The five pieces I contributed were all made from found objects, and were included in a section of authentic Hamsas from the Gross Family Collection.